Sierra Leone brings about feelings of concern and is typically thought of as a black hole in Africa, when in fact it is a country which many don’t know much about, other than it being badly hit by the Ebola outbreak in 2014-2016. This will surprise you! 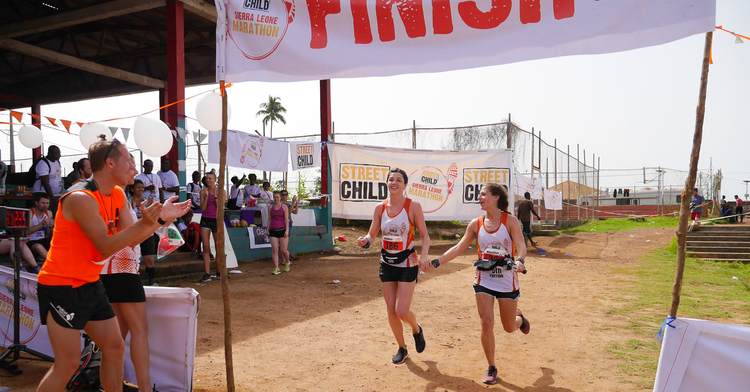 She Went Wild and Street Child presented Wild Films with the opportunity to go there and film the marathon that Street Child has been organising for the past seven years, they felt they just had to answer the call. Sierra Leone sits on the west coast of Africa above the equator in the temperate tropical zone. Sierra Leone is also home to a wealth of wildlife, huge areas of jungle and some of the friendliest people in Africa. It also happens to be one of the poorest countries in the world, with only nine others with more poverty. For this reason, Street Child operates there and their aim is simple; provide children with a good education and their parents with the means to keep them in education. Sreet Child also worked hard with Sierra Leone's authorities during the Ebola outbreak to ensure that people understood how to protect themselves and their families from the disease. Shooting in Sierra Leone was a big challenge for the crew at Wild Films. It was their first time in Africa and they had a limited luggage allowance in which to pack all their equipment, so they had to pack carefully. Once out there, the temperature was much hotter than the average they'd been expecting. 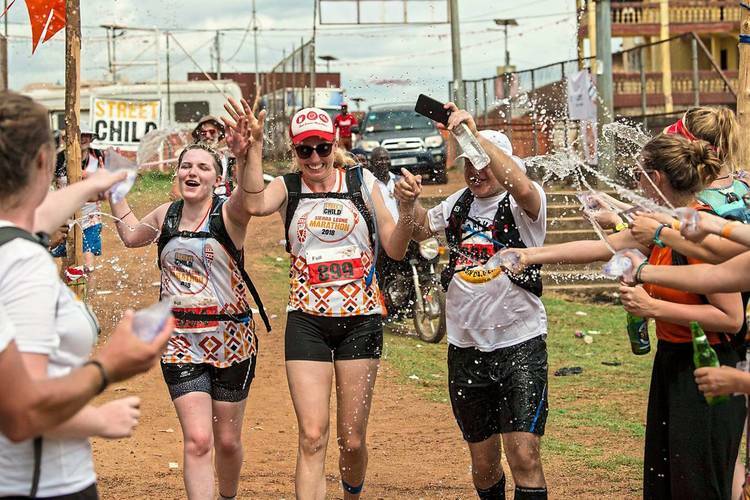 Typically in May, it is around 28ºC as it’s the beginning of the rainy season, but it hadn’t rained for some time and there was only the day of the marathon which was lower than 30ºC. Couple this with an average humidity of 70-90% and it makes for some difficult conditions to shoot in, let alone run a marathon! Wild Films were in Sierra Leone for a week; while the marathon is just a one-day event. 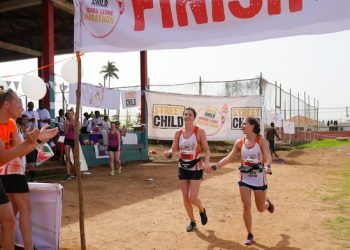 Street Child is keen for runners, volunteers and supporters to see where the money they are raising goes and how it is used. This means that several trips are planned – and this is what makes it an adventure. Street Child works hard to ensure the marathon trip is a safe way of seeing the country, as many of the places you’re taken to involve travelling across bumpy mud roads and on little metal rafts across rivers. Most people brought back many souvenir bruises from the bumps in the road which also caused their camera to bounce around on the cameraman's legs. Not to worry if you’re ill or injured while out in Sierra Leone, there is a team of British doctors and medics from Exile Medics on standby throughout the week and they do a fantastic job of looking after everyone. The crew arrived a day before most of the runners so they had a day to relax and acclimatise to the heat. The crew was taken around by a runner and two other volunteers to see the sites of the local town of Makeni, the businesses supported by Street Child (helping to keep their children in school) and the work done to and in schools around Makeni. On the Friday before the marathon, everyone travelled to two rural communities in the Upper Tambaka region, near Kilimi National Park on the border with Guinea. We crossed a river on a ferry, which the ferryman powers by pulling on a metal cable to get across the river (African style). Yes, and you can only cross one vehicle at a time. The scenery on route is spectacular and if you're lucky you can spot African Bush Elephants, Chimpanzees, Leopards and if you're really lucky even the shy and threatened Pangolin. The team then had the awesome privilege of visiting two schools in the area where much hard work has and is being done by Street Child. These kids embrace life with everything they have and it was a real treat. One of the persons in the group was the person who had sponsored the building of the school they visited and the chief of the community made him an honorary chief as thanks for what he had done. We had time to play games and interact with the kids and one member donated some footballs so we all played outside for a while. This makes one appreciate life so much more. Saturday was the day before the marathon and it was filled with workshops in which runners were educated on how Street Child supports family businesses and they also learnt a little Krio, the local language. There is so much to do that another trip is definitely called for. Besides learning a new language, you can visit more schools and interact with the kids and communities, filled with singing and dancing. A real highlight was a football match as we arrived back in Makeni. This was no ordinary match of footie, it was played by amputees from the brutal civil war from years ago. The teams were comprised of members from warring factions that decided to promote peace in Sierra Leone by playing football matches. What was so amazing was seeing how dexterous and fast these guys were. What was also impressive was some of the 5k and 10k runner entrants that also took part in the match. 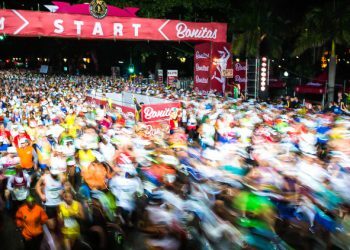 It was an early start on Sunday, as the marathon begins around sunrise in order to take advantage of the lower temperatures. It had rained overnight, so it was a pleasantly cool morning. It was a pretty manic day for the cameraman trying to keep up with the runners. He accompanied a photographer who had a car to whisk them around the marathon route and at several points had to race ahead of people to catch them on camera – such as the winner of the marathon, a locally known runner who completed the full course in an incredible 2 hours and 39 minutes! The team attempted to film and photograph as many of the runners as possible, but with around 80 international and over 600 local runners, it was a near-impossible task to catch everyone. It’s worth saying though that this isn’t a marathon to try and get a new personal best time at; it’s better described as a fun run than a race. 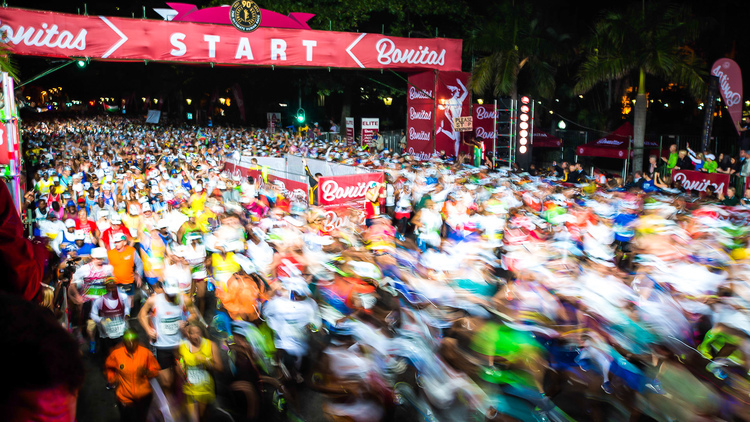 A completely crazy fun run, but one that you will be sure to remember forever. Oh yes after hard work comes some time to relax and so everyone does on the Monday after the marathon. The spot is Tokeh, a town on the coast of Sierra Leone near the capital Freetown. Tokeh is situated between two aptly-named river deltas, namely Rover No. 1 and Rover No.2 (not kidding). Tokeh has beautiful whites beaches and turquoise waters. River No.2 was made famous in the 1980's by an advert filmed there for Bounty chocolate and the locals insist on keeping Tokeh and the river beaches very clean and free of litter more so than anywhere else in the area. Most take this day to relax and unwind after a hard day out on the dusty roads of Makeni. Tokeh beach is the place to be and it is worth it for one of the most stunning sunsets in Africa. 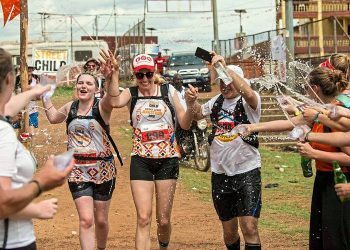 If adventure is your thing, or marathon running, or both, the Sierra Leone Marathon should be on your to-do list. There’s a reason why it keeps popping up in running awards and lists of things to do in Sierra Leone. Yes, it’s crazy, but it most definitely is worthwhile and you’ll come home with a hand-carved medal, some incredible memories and quite a few new friends.